Graphic abstract from Rasmussen et al, 2015. The latest plague news to splash across headlines is the discovery of Yersinia pestis aDNA in seven Bronze Age remains from Eurasia. The most important findings in this new study are not anthropological; they are evolutionary. This paper allows us to drop a couple more evolutionary mile markers. Finding 7% of the tested remains (7 out of 101) positive for plague is surprising, but I’m not yet ready to believe that it was endemic over such a huge area scattered over 2000 years. Not yet anyway. The new phylogenetic tree places Y. pestis in humans since the Bronze Age and the origin of the species as far back 50,000 years ago. It also opens up questions on the original reservoir species and the location of the birth of the species, although central Asia is still the most likely location. So let’s look at the genetic results in three areas highlighted by Rasmussen et al: flea transmission, Pla activity, and suppression of the immune response stimulating flagellin production. These traits are critical to producing bubonic plague as we know today. Late phase flea transmission of modern Yersinia pestis is dependent on the ability to survive in and colonize the flea. The Bronze Age strains have all of the plasmids and virulence genes of modern strains except one, the ymt gene that encodes the murine toxin. The basic tool set of modern strains also have deactivated or knocked-out the protein products of three ancestral genes that hinder Yersinia pestis biofilm formation. Remnants of these genes persist as pseudogenes in modern strains. (A pseudogene is the corpse of a former gene.) This genetic combination allows Y. pestis to survive in the mid-gut of the flea, persist longer and form a biofilm; a necessity for late phase flea transmission. However, as Monica Green reminded me, ymt is not required for early phase flea transmission, dirty-needle style (Johnson et al, 2014). In fact, since Y. pestis does not need to persist long or multiply at all, there are no known genes needed to be present or absent for early phase transmission. As I recently reviewed, early phase transmission is very common and effective (see Eisen, Dennis & Gage, 2015). Based on the dates of their samples, they estimate that ymt was gained in about 1000 BC. In the RISE509 strain from Afanasievo Gora in southern Siberia, the pde3 is inactive but the other two, pde2 and rcsA, are still functional. Taken together this genetic combination should allow early phase flea transmission but not late phase flea transmission that requires biofilm formation. They are still mid-way in developing late phase flea transmission. This makes sense for a microbe being transmitted dirty-needle style, providing the opportunity for natural selection to develop late phase transmission bit by bit. While early phase transmission can support regional epizootics and epidemics, late phase flea transmission is probably important for long distance transmission by fleas in grain or textiles, or by sea. The recent discovery of the Pla gene in Citrobacter koseri and Escherichia coli, other enteric opportunistic flora, but not found in Yersinia pseudotuberculosis, suggests that lateral gene transfer brought the plasmid to the young Y. pestis while still in the enteric environment (Hänsch et al, 2015) . This is consistent with Y. pestis Pla and Salmonella enterica PgeE both evolving from the same ancestral omptin ancestor in an enteric environment (Haiko et al, 2009). This suggests that Y. pestis may have remained an enteric organism for some time after it split from Y. pseudotuberculosis. 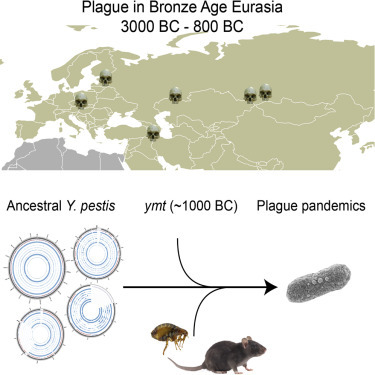 Six of seven Bronze Age Y. pestis strains contain the Pla gene required for deep tissue invasion and bubo formation. Rasmussen et al (2015) suggest that the strain lacking the Pla gene has lost it and that this gene has been lost more than once in the phylogenetic tree. In other words, Pla was present in the common ancestral strain. However, to support development of bubonic plague Pla needed to gain a mutation at position 259 that these strains lack (Haiko et al, 2009). So the Pla gene without the mutation at position 259 can support pneumonic plague but not bubonic in the Pestoides F strain (0.PE2) of Y. pestis (Zimbler et al, 2015). On the other hand, Sebbane et al (2006) showed that strains completely lacking Pla can still develop primary septicemic plague following flea transmission. They can envision an “evolutionary scenario in which plague emerged as a flea-borne septicemic disease of limited transmissibility”(Sebbane et al, 2006). Without the polymorphism at position 259, bubo formation should be retarded, if not suppressed. A third genetic difference of possible significance is the apparent ability to produce flagellin, a major activator of the human innate immune system. Modern Y. pestis strains have deactivated the production of flagellin by a frameshift mutation in the regulatory gene flhD. The Bronze Age strains lack this frameshift and so presumably had normal flagellin production. However, Y. pseudotuberculosis and Y. enterocolitica down regulate production at mammalian body temperatures. If the ancestral Y. pestis did also then its possible that it wasn’t a factor in human infections. Experimentally recreating the regulatory environment from Y. pseudotuberculosis would be much more difficult than simply inserting an intact copy of the gene in a modern strain of Y. pestis. Predicting the impact of these ancestral genes is highly conjectural. This combination of genes has never been studied together. Since these strains were isolated from human remains we can assume that there is a path for transmission and pathogenesis. The reliance on early phase flea transmission, the less virulent pla allele and the possible production of flagellin suggest that Bronze Age local (dermal) infections from flea bites would be less virulent (more survivable). Interestingly, these milder local infections may have been immunogenic. As Y. pestis moved away from an enteric lifestyle, producing a septicemia was necessary for either flea transmission or development of a secondary pneumonia with aerosol transmission. I find it hard to believe that Bronze Age Siberia or Estonia had a large enough population for sustained pneumonic transmission. Since Pulex irritans can transmit Y pestis without development of a biofilm, there is no reason to see humans as a dead-end to flea transmission even as early as the Bronze Age. Humans could have also contracted septicemic plague by ingesting infected meat. Although natural ingestion infections are very rare today, this mode remains effective. A village size outbreak could easily occur from sharing a large infected animal as happened in Afghanistan in 2007. In that outbreak a single infected camel shared among two villages produced 83 probable cases of plague with 17 deaths, a case fatality rate of 20.5%. (Leslie et al, 2011). Last but certainly not least, the further back we go in Yersinia pestis‘ evolution the more likely ingestion is to be a mode of transmission like its ancestor Yersinia pseudotuberculosis. Its takes more than good transmission to cause a demographic changing epidemic over large areas like the Eurasian continent. It also requires a fairly high human density and good trade or communication routes. Humans play the the most important role in transmitting plague of pandemic size. I can’t say if the cultural factors that make such large epidemics possible were in place in Bronze Age Eurasia. Let’s keep things in perspective before we conjure up the specter of virgin soil epidemics of plague in the Bronze Age. Yersinia pestis is the kind of over achiever that may have been a player in Bronze Age demographics but it would be nice to have a lot more evidence before jumping to that conclusion.